By: Lawrence S. Levin, Ph. D.
Over the past 18 years I have helped senior teams from many different industries learn to navigate growth, manage significant and complex change, and address the new and ever-changing global marketplace and economies. These experienced teams have had to react to sudden shifts in political and economic conditions, as well as unexpected market changes and sudden technological shifts. These are smart people doing what is “business as usual” for a top team—or at least should be. And these teams are both committed and ultimately responsible for setting and executing strategy, for ensuring financial results, and for securing a future for their employees. Top Teaming is the culmination of the knowledge and experiences I have had in working intimately with top teams – and those striving to improve their effectiveness. In my research and interviews with senior leaders, I have found that there are ten essential groups of practices that differentiate Top Teams from high-performing groups of talented and hard-working individuals. These are the “must-do’s” that make the difference between great teams that drive great results and everybody else. 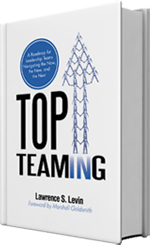 Top Teaming is ultimately a practical “how-to” book, written from the point of view of 18 years of experience working with senior teams. What is most new and novel about this book is the very practical, effective, and hard-hitting suggestions necessary to make a good team, even a high performing team, even better. Top Teaming is about the conversations that Top Teams must have. It describes the increased level of performance required in today’s increasingly complex and volatile world. It is based on interviews and work with CEO’s and Executive Teams from different industries that have excelled in the past several years in an environment where many other companies have failed. This book is intended for anyone that has a mission-critical leadership role in a company and thus must be effective in their role as a leader or member of a team. It is intended for leaders to read and teams to study together to see what they can and must do to “raise the bar” of their performance. Each Chapter has a series of questions that challenges the reader to assess those practices within her/his current team against what Top Teams actually do. Frequent case studies and brief stories are cited. The Appendices contain a checklist and an assessment about the most critical leverage points for improving team performance. In this way, the book is practical, relevant, and useful. Given the need for Executive and Managerial Teams to become even more effective, Top Teaming provides a strong road map forward.